Mar Georgius (Hugh George de Willmott Newman) (1905-79), Patriarch of Glastonbury and sometime Prince-Catholicos of the West, was a Prelat-Commandeur of the Order of the Crown of Thorns (brevet 45/1094), Knight Grand Officier of the Order of the Lion and of the Black Cross (brevet 46/244), and Doctor Christianissimus, having been admitted to the San Luigi Orders by Prince-Abbot Edmond I. 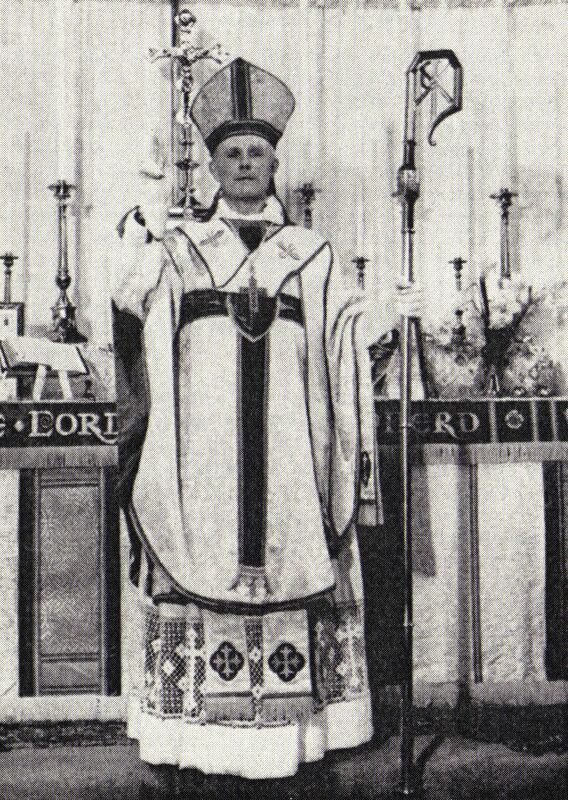 He additionally served from 1946 as Exarch for Britain of the Order of Antioch under Bishop Howard Ellsworth Mather (this branch of the Order was absorbed into the Abbey-Principality in 1963). The insignia of the OCT was conferred upon him by Archbishop Odo A. Barry by commission of the Prince-Abbot in 1955. After a disagreement, he was removed from the Roll for some years, but this matter was subsequently resolved and he was reinstated in full in 1964. The future Mar Georgius, then Hugh George Newman, was born in Forest Gate, London, on 17 January 1905 and baptised in the Catholic Apostolic Church (sometimes called the “Irvingites” or The Universal Church) at Mare Street, Hackney. The CAC received what they believed to be a divine revelation that led to the calling of twelve men as a Renewed Apostolate in the 1830s, with the belief that this would prefigure an imminent Second Coming. These dramatic developments produced a widespread and at one point numerous following, assisted by the fact that the CAC did not seek to present itself as a separate church but as a universal body dedicated to presenting the Renewed Apostles to mankind in general and specifically to other churches, which it hoped would then adopt and support their cause. The failure of such bodies as the Church of England and Roman Catholic Church to accept the CAC’s Testimony forced the CAC to pursue a more independent existence as a church body than it would have chosen for itself, and in time divisions within the Apostles and their successive deaths without the Second Coming having occurred led to the movement slowly fading away. There was no provision for the calling of further apostles to replace those who had died (although one body in continuation of the CAC held otherwise and established an episcopal succession which continues to this day), and no new clergy could be ordained to major orders after the last Apostle, Francis Valentine Woodhouse, had died. Newman was to fulfil his vocation by leading a church that combined elements of the CAC, and indeed was believed by him to be a direct continuation of it, with Eastern and Western Orthodoxy, but the origins of this body were also to be found substantially in English Old Catholicism. Newman’s grandfather was a deacon in the CAC and his father a Subdeacon, and aged seven, Newman himself was admitted as an Acolyte. He was educated at the Crawford School, Camberwell, and later at evening classes and under a private tutor, having passed the general school leaving examination under a special provision at the early age of thirteen. Newman took employment in solicitors’ firms and at the age of 21 was promoted to Managing Clerk. At this time, he was politically active, and participated in attempts to restore Archduke Otto von Habsburg to his rightful position as Emperor of Austria and King of Hungary and Bohemia. In recognition of these efforts, the Archduke Otto, then under the Regency of his mother, the Empress Zita, granted a number of senior titles of nobility to Newman, including Prince of the Holy Roman Empire, Duke of Saxe-Noricum in the Austrian Empire, and Baron Willmott in the Kingdom of Hungary, in 1925. Newman accordingly changed his surname by deed poll to “de Willmott Newman”, the added title reflecting his mother’s maiden name. 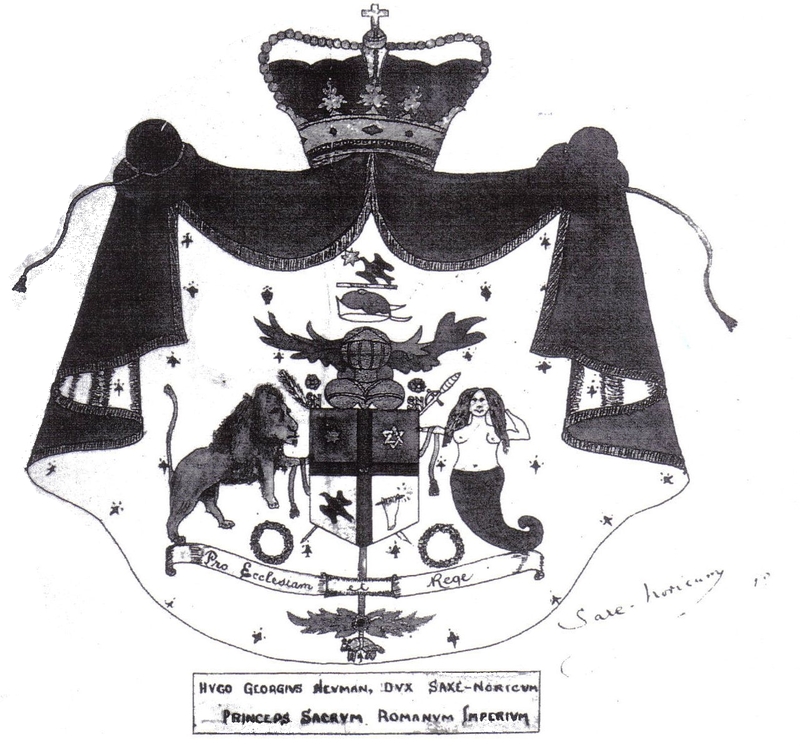 In May 1929, de Willmott Newman was one of the founders of the Royalist International, together with the author Herbert Vivian, Charles C. Bagnall (described as “an old New Zealand Jacobite”) and Fregatten-Kapitan Emmerich Zeno von Schonta (erstwhile Aide-de-Camp to Emperor Charles of Austria). The Royalist International aimed to “combat bolshevism, and restore Monarchy everywhere.” This body published a magazine, the Herald, from 1930 onwards, and had some success in Jacobite circles in the pre-war years. This work brought Newman into personal contact with a number of members of the European Royal Houses and aristocracy. Although Newman had felt a vocation to the priesthood since the age of sixteen, the Catholic Apostolic Church (having since 1901 entered the “Time of Silence,” with the death of its last Apostle) had decided not to ordain new clergy. In order to overcome this obstacle without breach from the church of his birth, Newman was required to consider in detail exactly why he was feeling this call and exactly what he should do in order to fulfil it within the CAC’s theology. Aged nineteen, he was admitted an underdeacon in the CAC. Around this time, Newman’s vocation became more certain, and he was convinced that he was called to the office and work of a Bishop. He discussed this with the clergy of the CAC, who told him to be patient and await a time when God’s plan was revealed in more detail. “(1) That just as the Tabernacle in the Wilderness was not intended to be permanent, but was a model or pattern in accordance with which the Temple was later erected in Jerusalem; so, the work by the Restored Apostles was a pattern of a greater work thereafter to be established in the Church at large. (2) That the Restored Apostles, having completed the pattern, thereby laying the foundations of the future work, the pattern was destined to be taken down, so that the greater work might be established in Christendom at large. Accordingly, no attempt was to be made to perpetuate the Apostolic Work after the death of Apostle Woodhouse, but it was to be suffered to gradually fade away until “the Altar was covered”, i.e. the Holy Eucharist had ceased to be offered. (3) That, just as our Lord Jesus Christ, after sending forth the New Testament Apostles, later “sent other Seventy also before His face into every place whither He Himself would come” (Luke x, 1), so, after the removal of the Tabernacle, the work of the Restored Apostles would be succeeded by the Work of the Seventy. These would not be Apostles, but apostolikoi, or Apostolic Men, who would receive their doctrine from the Restored XII. It would be to these men that the work of applying the pattern to the Church at large, or erecting the Temple upon the foundation already laid, would devolve. This work is that laid down by the Restored Apostles in their prophesies of 1858-60; that their church should be succeeded by a future episcopal body, which had been awaited at the commencement of the “Time of Silence” in 1901, but that most CAC members had come to accept would not appear at any definite stage. This mission was what Newman believed himself to be called to accomplish. Newman believed that it had been revealed to him by God that he was to undertake a mission in connexion with the Work of the Seventy, and initially with the work of augmenting the number of the Apostles from the Restored Twelve to twenty-four by the commission of twelve further men to fill their ranks. Although Newman later came to believe that his focus on the additional twelve was in error, with hindsight we can see the two phases of his ministry, representing concentration on the Twenty-Four and on the Seventy respectively, as complimentary to each other rather than in conflict. Clearly these men were to be found outside the CAC, for the CAC’s work was coming to an end and was in any case separate, though connected to the episcopal church that would follow it. So it followed that Newman would need to understand thoroughly what the different churches that made up Christendom believed, and how and on what points they differed. He would not, however, need to leave the CAC even were he to be ordained outside it – for since its outset the CAC had included among its clergy those ordained in the mainstream Apostolic Succession, whose orders were recognised through a simple blessing, those ordained in non-Apostolic churches being meanwhile reordained ab initio. An important discovery in consequence of these detailed studies of the different churches had been of the close relationship between the theology of the CAC and Orthodoxy of the Eastern Churches. The exact correspondences would be properly the preserve of an experienced theologian to explain in full, and such a work was indeed undertaken by the late Dr Judith Pinnington in a series of articles in the “Glastonbury Bulletin”. We may, however, summarise the conclusion arrived at, which was that there was no contradiction inherent in the teachings of the CAC, including the Restored Apostolate, and commonly-understood Orthodox precepts as far as the churches led by Newman were concerned, throughout his lifetime and for some years after his death. Bishop McFall, who was resident in Ireland, released de Willmott Newman from his jurisdiction soon after ordaining him, and so the new priest approached Archbishop Arthur Wolfort Brooks (Mar John Emmanuel), Primate of the Apostolic Episcopal Church, seeking episcopal oversight. On 8 October 1941, Mar John Emmanuel accepted the office of Presiding Bishop of the Old Catholic Orthodox Church. On 26 October he issued a Brief constituting de Willmott Newman as Abbot Nullius of St Albans in the Order of Corporate Reunion, and on 30 October appointed him Archpriest and Vicar General of the Old Catholic Orthodox Church in Europe. In “A Twig on the Tree of Life” de Willmott Newman wrote, “Thus did the faithful remnant of the Movement started in England by Archbishop Mathew, who derived his Orders from the Old Catholic Archiepiscopal See of Utrecht, come under the jurisdiction of a Bishop in America whose Orders were derived from the Uniate Patriarchate of Babylon in far-off Chaldea.” Mar John Emmanuel was generous in his support, too, sending frequent consignments of Holy Oils across the Atlantic for the use of the church. In 1929, having left his employment in the solicitors’ firm, Newman had spent a year in detailed study of issues of liturgy, history and the law, educating himself as many had done before him through long hours in the British Library Reading Room. This being completed, he obtained the post of Legal Consultant to The Christian Herald (which also involved providing legal advice for the numerous other enterprises of that magazine’s proprietor, Michael Paget Baxter) and at the same time took up private practice as a Commercial Consultant. In the latter field, he studied part-time by correspondence for the examinations of the Institute of Commerce, and would eventually become a Fellow of the Institute. He was also actively engaged in charitable work with the London poor, giving of his time to act as honorary secretary for several charities running soup kitchens and clothing distribution schemes for the poor and homeless as well as hostels for girls and women who found themselves in London without means. In his legal work, he tended to champion the underdog, and as a result found himself on more than one occasion the subject of opprobrium in the more jingoistic quarters of the press. Political activity was a major preoccupation. After brief involvement with the pre-Mosley British Fascists, de Willmott Newman became an active Conservative, before leading a large number of his local association into the new United Empire Party of Lords Beaverbrook and Rothermere in 1930. This party, which advocated free trade, was short-lived and consequently de Willmott Newman rejoined the Conservative Party in 1932, becoming Chairman of the Bowes Park and New Southgate Conservative and Unionist Association. He resigned from the Conservative Party in 1936 at the time of the Abdication Crisis, holding that it was guilty of “high treason”. Three times Newman stood for the Southgate Urban District (later Borough) Council, as a Conservative and Municipal Reform candidate, but each time he was defeated. This did not dent his political enthusiasm, however, although this was increasingly channelled through activities outside the mainstream of party politics, and he was at various times Chairman of the Southgate (South Ward) Municipal Reform Association, Chairman of the Wood Green and Southgate Branch of The Tudor Rose League (which encouraged a “Buy British” policy) and Honorary Secretary of the Wood Green Habitation of the Primrose League. In due course, Newman worked closely with the 5th Earl of Malmesbury and Edward Doran, MP, to raise a number of issues in Parliament, including an amendment to the Hire Purchase Bill of 1938 on which subject de Willmott Newman was invited to address a group of peers. de Willmott Newman was also engaged at one point in a case where Goering and Goebbels sought control over a German-language newspaper that was published in London, the Neue Londoner Zeitung, and managed to prevent this from coming about. Newman also supported the India Defence League, in which he particularly collaborated with Sir Louis Stuart (1870-1949), who was a former Chief Judge of Oudh (modern-day Awadh). The purpose of the League, which was founded by Winston Churchill and others in 1933, was to support the cause of India remaining within the British Empire, and eventually its membership grew to include over one hundred peers and many Conservative Members of Parliament. Newman also became Chief Organiser of the National Council of Farmers’ Guilds and Chairman of the Council’s Brighton and Hove Branch. He became a convinced supporter of the guild system, and in an article published in 1940 advocated its revival. This busy period saw his marriage on 16 January 1937 to Miss Lola Ina del Carpio Barnardo (1902-84) at the Catholic Apostolic Church, Maida Hill. de Willmott Newman’s wife, who he had first met in September 1934, was a great-niece of Dr. Thomas John Barnardo, founder of the eponymous childrens’ homes. 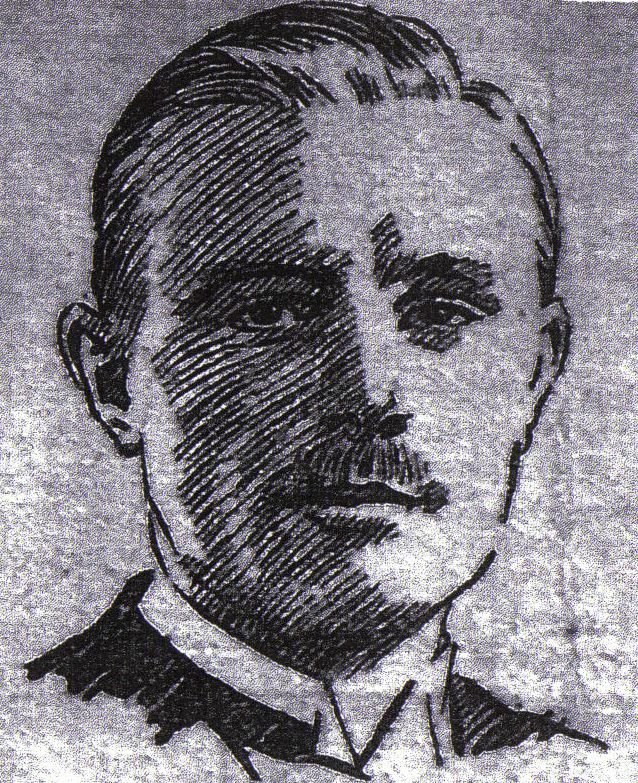 Just prior to his marriage, de Willmott Newman had left his employment to become General Manager and Secretary of The National Association of Cycle Traders (NACT), an employers’ trade union, which position he was to hold until 1943. He was editor of its official periodical, the National Journal, and published a good deal of his own writing in this organ, as well as several relevant books and pamphlets. He was effective in persuading Ernest Bevin and Raymond Evershed, KC (later a Lord of Appeal in Ordinary) to establish a Joint Industrial Council that would regulate pay and conditions for workers in the cycle trade. He also appeared at many tribunals on behalf of Association members, and as a pacifist, was committed to assisting those who sought exemption from military service. He moved to Northampton in 1940 (from where he travelled almost constantly to London on business), but returned permanently to London in 1943 and established his residence initially at Forest Road, Enfield Lock, subsequently living at Kew, Acton and Highbury. In 1943, de Willmott Newman became Secretary and Registrar of the Incorporated Institute of Cycle Traders and Repairers, which was founded in 1941 by Arthur Gillott, who had been a leading member of the NACT and was later to be described as one of the world’s finest cycle makers, with de Willmott Newman’s support and assistance. The Institute ran evening classes in cycle repair, trading, and construction, issuing its own trade diplomas, and continued its activity through the 1950s. However, the Institute was not able to generate enough work to continue to support Newman as a full-time and salaried member of staff, and accordingly he resigned in 1945 to resume his practice as a commercial consultant and engage in other business activities. Latterly he served on the staff of “The Grocer” magazine. Until the outbreak of war, he was serving as Acolyte and later Scribe at the Catholic Apostolic Church “Horn Congregation”, Wood Green, London (all but the most senior CAC clergy were non-stipendiary). We are told that in these early days he was known as “The Man with the Medieval Mind”, reflecting his marked traditionalism, and that he assembled a personal library that ran eventually to 7,000 volumes. He became a popular lecturer, addressing the men’s meetings at the CAC as well as speaking to adult education classes, political groups, and at Wood Green’s “Spouters’ Corner” on a Primrose League platform. Comprised of the representatives of the British Vilatte-succession churches and other related bodies, the Council took the view that this unjust repudiation was a deliberate act of schism. It had come about as the result of a combination of factors; weakness in the Syrian Orthodox Church, Anglican pressure from those who saw the Vilatte succession as a threat to their dominance, and the refusal of the American Catholic Church, a major Vilatte-succession body, to agree to a substantial increase in its payments to the Syrian Orthodox Church. Accordingly the Council declared, citing canons 35 and 37 of the Quinisext Council for precedent, that the Patriarch of Antioch was deposed and that the lawful and legitimate continuation of the Syrian Orthodox Church rested with their numerically tiny body, which they renamed the Ancient Orthodox Catholic Church for the avoidance of confusion. Since the leading voices of the Council of London were staunch Legitimists and Jacobites, they were inclined towards a strictly legalistic view of these matters, even though they could not hope to enforce their conclusions regarding the Syrians in any practical sense. William Bernard Crow (1895-1976), Bishop of Santa Sophia and a noted esotericist, was elected Patriarch of Antioch in the AOCC as Mar Basilius Abdullah III. What had effectively happened was that the Syrian Orthodox Church, having created two distinct Western missions (those of Archbishops Ferrette and Vilatte) with deliberate autocephaly, had also compromised its organisational integrity in so far as those missions were deliberately affiliated to the church, and to that extent a part of it, but under a deliberately loose control, and without the usual staticons limiting jurisdiction. This gave these missions the potential to continue to claim to be a part of the Syrian Orthodox Church without actually being directly subject to it, moreover they accepted the Western faith of the Seven Ecumenical Councils rather than the Oriental Orthodox position. They were, indeed, no less a part of that church than any other parish or mission, but the mother church had placed itself in a position where she was effectively being held responsible for something over which she had less and less control. Perhaps this status quo could have continued indefinitely, but the political situation (in this case occasioned by Anglican interference) would more likely have induced a crisis point sooner rather than later. This would inevitably lead to schism, with two groups each claiming validly to represent the Syrian heritage, but independent in their governance, and each (unsurprisingly) repudiating the other. Doubtless this makes sense in practical terms, and could well have fended off some of the worst external attacks on the Council. But it ignores the crucial question of identity. Churches, and indeed entire races and peoples, have through history had to contend with situations in which they were placed in exile, under oppression, and with their authority usurped by a seemingly invincible hostile party, finding themselves reduced to a handful of adherents meeting in semi-secret. Too often, the rightful party has had to play David to a Goliath-like opponent. Thus it was with the Council of London; thus it must also have seemed to bodies such as the Polish Government in Exile, meeting powerless in Paris, then Belgium, then London, for over half a century while the Soviet-backed Communists exercised power in their homeland. But what mattered about the Council of London was not the prospect of realistically or otherwise claiming the church property that it held to be rightfully its own, nor of aiming to subjugate other elements of Christendom; it was the assertion of its Syrian heritage as a powerful, unified and cogent identity in the body of a valid church and ecclesiastical movement with an ecumenical vision that has endured to this day. It is that statement of what the Apostolic communions were, as far as their ideology, theology and presence in Britain was concerned, that is the lasting legacy of the Council of London. Mar John Emmanuel at this time suggested that de Willmott Newman should seek election to the episcopate as Archbishop and Metropolitan of Glastonbury. He was elected at a Pro-Synod of the OCOC on 8 October 1943 and a mandate signed by Mar John Emmanuel on 20 December was then sent to Mar Basilius Abdullah III authorising him to perform the consecration. On 23 March 1944 a Deed of Declaration under Mar Jacobus II united the bodies known as the Ancient British Church, the Old Catholic Orthodox Church, the British Orthodox Catholic Church and the Independent Catholic Church into a single organisation, to be called The Catholicate of the West. These were churches that had a continued legal existence from their historic foundations, but at that point very few clergy and no significant lay membership. At a meeting of the Governing Synod of the new church on 28 March, under the presidency of Mar Jacobus II, de Willmott Newman was elected Catholicos of the West. He was consecrated and enthroned as Mar Georgius by Mar Basilius Abdullah III on 10 April 1944, in the Cathedral Church of St Andrew, Stonebridge Road, Tottenham, and immediately established intercommunion between his jurisdiction and the Apostolic Episcopal Church under Mar John Emmanuel. On 29 January 1945, Mar Jacobus II resigned the office of British Patriarch (which originated in the lineage of Mar Julius of Iona (Ferrette)) to Mar Georgius, who thus became the sixth head of the “oldest of all non-Ultramontane Catholic movements, for it was erected as long ago as 1866”. Mar Georgius’ Holy Governing Synod of the Catholicate of the West passed Act no. 3 at Christmas 1944, stating that, “It hath now come to regard the work of the Catholic Apostolic Church as a model or pattern of a greater and more extensive work yet to be brought into manifestation among the peoples of the world, and accordingly hath been moved to bring the Ministry, Organisation, Usages and Worship of the Catholicate into general conformity with this pattern.” As a direct result, the title “The Catholic Apostolic Church (Catholicate of the West)” was adopted, with the subtitle “The Western Orthodox Catholic Church”, and the CAC Liturgy was adopted with a Supplement, together constituting the Glastonbury Rite. 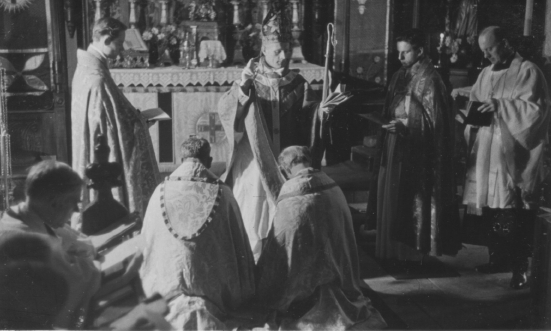 In 1951, most unexpectedly, Mar Georgius was offered the Apostolic Ring of the last of the Restored Apostles, Francis Woodhouse, who had died fifty years previously. Mar Georgius took this event as a sign that he was indeed to take up the work of the CAC. Most importantly, external authorities and the Christian community at large, to whom the mission of the Catholicate of the West was addressed throughout, would find that this body was indeed “all things to all people,” to cite a phrase from the consecration liturgy. Those who sought a Roman Catholic heritage would find it in the Order of Corporate Reunion lineage. Those who sought an Orthodox heritage would find lineages from the Syrian, Russian, Jacobite and other churches. Those whose faith was Anglican or Liberal Catholic would also find their heritages represented, as indeed were the Free Churches. With an œcumenical basis such as this to draw upon, no critic could reasonably find the sacraments of the Catholicate invalid or its appeal less than universal. Liturgically too, we should recall for analogy the process of synthesis of the different Christian traditions that had culminated in the liturgy of the CAC, and that was to find further expression in the Glastonbury Rite of the Catholicate. Mar Georgius had adopted the idea of twelve apostolikoi, chosen from among his fellow Free Catholic bishops and the men whom he himself had consecrated. He also affiliated the churches associated with the Twelve as autocephalous tropoi of the Catholicate, but relations with these bodies were not to run smoothly. The very wide diversity of the theologies represented was inevitable given their roots, and their autonomous origins meant that they saw their ties with the Catholicate as readily frangible when, as frequently happened, disputes developed. Nor was there any effective strategy to resolve these matters; there was no agreed disciplinary structure within the organization and any measure, however justified, had little or no effect upon those concerned. On 1 June 1952, concerned to put his work on a firmer footing, Mar Georgius promulgated a dogmatic statement of belief entitled the Glastonbury Confession, intending that the Catholicate of the West would “cease to be a mere union of organisations, but rather a centre of dogmatic union…under a United Hierarchy and subject to its discipline.” It was stated that no free copies of the Glastonbury Confession would be supplied, which measure was presumably intended to compel the clergy to purchase the work which was now held to be binding upon them. By December 1952, it was announced that Mar Georgius was suffering from the effects of over-work, such as to cause prayers to be said for his health. Having incorporated the Catholicate of the West together with the Western Orthodox University and the International College of Arms and the Noblesse under the Indian Societies Act on 5 February 1950, Mar Georgius accordingly moved to surrender the corporation on 29 November 1953 and issued an Encyclical Letter “concerning the Dissolution of the Catholicate of the West”, also citing difficulties that had arisen in his relations with his Exarch-Elect of the Indies, Mar Petros (J.G. Peters). The effectiveness or otherwise of this act of dissolution would become the subject of significant controversy in later years, and was only finally resolved in 1976-77 when it was concluded that the purported dissolution did not in fact affect the continuing existence or mission of the Catholicate of the West, and that it had continued in the United States under its commissioned hierarchy there. 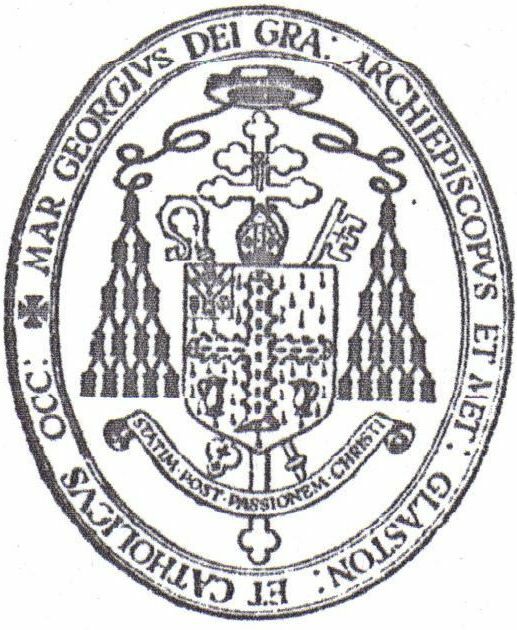 Indeed, Mar Georgius himself had characterized his actions as the “voluntary abandonment” of the Catholicate. Meanwhile, Mar Georgius spent a year on retreat, having established a new body, the United Orthodox Catholicate, to make a “clean start”. In as much as the key intention of the Catholicate was that it should become an organization with a lasting and substantial lay following, it did not achieve its aims, although at its zenith in 1946, Newsweek credited it with 140,000 communicant members worldwide. Everything in legal and hierarchical terms had been done to enable it to attract and retain members, and the theological position was likewise extensively thought-out and expounded in numerous publications. Although the liturgy was complex, it was no more so than that of its antecedent the CAC. Likewise the appointments within the hierarchy and the titles accorded their holders served a wider purpose for their existence, rather than being empty of meaning as was the case with some of the Free Catholic bodies. There were several notable London churches attached to the movement, including the Cathedral Church of the Good Shepherd in Lower Sloane Street, Chelsea, and the Cathedral Church of St Andrew in Tottenham, and a number of gifted clergy had been recruited. There were several public events, such as the 1948 Congress of Healing organised by Fr. John Beswarwick, one of the priests of the Catholicate, at the Kingsway Hall in London, when 1,750 people were present and Mar Georgius spoke and gave a blessing. But there was also significant opposition from the Anglicans, which drove away both clergy and laity, and from other Free Catholics and Spiritualists, the latter being accused of attempting to take over the body.. Where acceptance and even assistance had been hoped for from other churches, the response was only a sour-faced hostility that has lingered long in the memory. In 1947 Mar Georgius won an apology and damages in libel from the publishers of Crockford’s Clerical Directory, and was also successful in a libel action against a Spiritualist newspaper; this was in addition to the numerous responses issued by him to hostile material in various journals, some by named critics and some anonymous. The Catholicate was not successful in creating a permanent financial endowment for its continuation, despite frequent appeals for such. Its tendency towards damaging internal dissent also eventually left Mar Georgius isolated and, perhaps in an over-reaction to Anglican attacks on those esoterically-minded clergy associated with the Catholicate, moving towards a stricter Orthodoxy and the abandonment of his original mission. As a leader, he had demonstrated an ability to relate successfully to each person on their own terms in a wide ecumenism, but he could not ultimately unite them in the service of a common cause, and perhaps unjustly blamed himself for this failure. Nevertheless, the Catholicate was not without its successes. It had created a body that brought œcumenical reunion into reality. It had established a theological position that was cogent, orthodox and consistent without being exclusivist or narrow in its perceptions. It had brought together a number of men of undoubted calling and ability, whose work together resulted in worthwhile ministry, even if they did not remain together for long. The greatest achievement of the Catholicate was thus ultimately as an enabler of the ministries of others. We should also note its synthesis of esoteric authorities, particularly from within Rosicrucianism and Freemasonry, of which Mar Georgius divested himself in toto during 1953-55 in favour of Archbishop Richard, Duc de Palatine (Ronald Powell). In November 1953, Mar Georgius formed a new body called the United Orthodox Catholic Rite to continue his work, and in 1959, by which time the erstwhile Exarch-Elect of the Indies had died, this entity would again adopt the subtitle Catholicate of the West. The ensuing decade was quiet, and there was little in the way of lay expansion, although a number of clergy were to join over the years. Some steps of compromise were taken to appease Anglican critics, who had already been partly mollified by the Glastonbury Confession; notably the recantation in respect of the conferral of Holy Orders upon Anglican clergymen that was issued by Mar Georgius on 15 August 1959. Buildings were also lost to the Catholicate, and by the 1960s the only remaining public place of worship was the Collegiate Church of the Epiphany at Bristol. This period was, however, a fruitful one for Mar Georgius as a writer. He published a number of key works on Free Catholic history; “Episcopi in Ecclesia Dei and Father Brandreth” (1962) being a thorough rebuttal of the Anglican polemicist; “The Man From Antioch” [dealing with Archbishop Ferrette] (1958); “In the Shadow of Utrecht” [Archbishop Mathew] (1954); “What though the Spicy Breezes” [Archbishop Alvarez] (1954); “A Voyage into the Orient” [Bishop Herford] (1954); “Blind Lanes and Alleys” [the Non-Jurors] (1960); “The Reluctant Bishop” [Stannard] (1964); “The Sad Case of George Forster” (1963); “Varied Reflections” (1954); “A Chapter of Secret History” [the Order of Corporate Reunion] (1961) and “A Twig on the Tree of Life” [the OCOC] (1960). The Second Edition of The Glastonbury Confession came out in 1960, as did An Orthodox Catholic Catechism. All these valuable books, which in most cases make a significant contribution to the understanding of their subjects, have regrettably been allowed to fall out of print. They are works of careful research, and even when their premises are controversial, they are well-presented and supported by evidence. In addition, the regular publication of The Orthodox Catholic Review (first published 1944; renamed The Glastonbury Bulletin at its relaunch in 1970) continued, which had previously been supplemented by a clergy journal, Hieratica. By the time of the Centenary Celebrations of the Catholicate of the West at the Caxton Hall in 1966, Mar Georgius’ clergy was again not composed of those who were strictly orthodox in matters of faith, but included a number of men whose theological interpretations were of a more liberal nature. Unfortunately, this involved some unwise associations, and moreover the new policy of “open communion” at the services of the Catholicate brought Mar Georgius back into contact with Free Catholic clergy with whom he had previously had serious differences and of whose positions he disapproved. Eventually, in a major schism in February 1967, most of the liberal elements of Mar Georgius’s CAC seceded from his jurisdiction, and he was left with a very small body of clergy that was predominately committed to a “mainstream” vision of Orthodoxy. The late 1960s saw Mar Georgius, now strongly influenced by other clergy, making substantial changes in the nature of his church to reflect its now-predominant outlook. The process of change now adopted consisted of an almost total repudiation of the original basis of Mar Georgius’s ministry; a Second Council of London was convened for this purpose, and would proceed to repudiate the basis of its namesake. 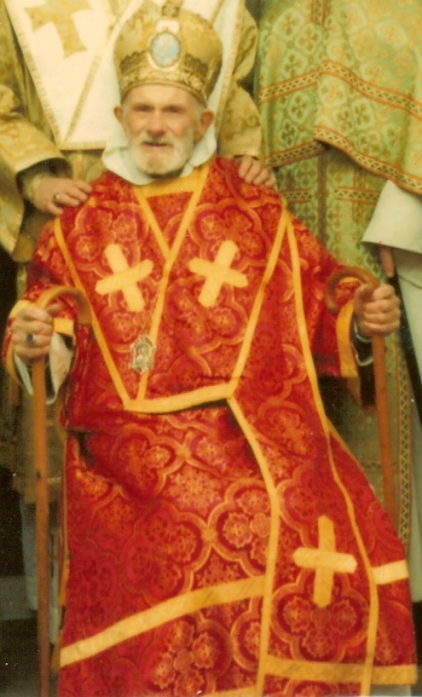 At its session in the Kingsway Hall on 25 February 1967, the following Resolution was passed, “That this Council, recognising that His Sacred Beatitude the Patriarch-Catholicos Maran Mar Georgius I, has been called by the Holy Spirit to be an Apostle of Jesus Christ, commissioned to the work of the Restoration of Orthodox Apostolic Catholicism and the Theocratic Way of Life, by way of preparation for the Coming of Christ the King, re-affirms its loyalty, obedience, and support for him in the fulfilment of his Special Mission within the One Holy Catholic and Apostolic Church”. This term “Apostle” was, as Mar Georgius subsequently explained, to be understood in the context of an apostolikos and not as one of the Restored Twelve. On 12 November 1967, Mar Georgius exchanged the Kiss of Peace with Kyr Athenogoras, Patriarch of Constantinople, in the Greek Orthodox Cathedral, Bayswater. On 30 December 1967, Mar Georgius proclaimed a complete repudiation of the “Free Catholic Movement” and repealed the 1960 Constitution, replacing it with government by decree so as to re-organise his church. This re-organisation was explained by Mar Georgius thus, “the somewhat Roman ethos which pervaded it should be abolished in favour of a greater conformity with that of the early Church, and that to effect this the simplest way would be to adopt the Eastern Orthodox ethos, which had remained the same throughout the ages, subject, however, to the Gallican traditions, which were as much part of Orthodoxy as the Byzantine.” In accordance with this, the liturgy was substantially revised in 1968 and the revived Catholicate of the West was formally dissolved on 1 January of the same year. Mar Georgius writes, “In January 1969, it was urged on me by certain of my advisers that our Church would have no future unless it secured communion with and recognition by what they described as a “canonical Orthodox Church”, and that, to achieve this, certain further reforms were necessary, including the abolition of the Patriarchate and of “open communion”. At that time I was not prepared to discuss with them that which I knew to be my real mission, and I felt that to abolish the Patriarchate was an abandonment of a sacred trust. So far as obtaining the “recognition” of any other Orthodox body was concerned, though I would have welcomed this, a quarter of a century’s experience had taught me that anything tangible in the way of results was most unlikely. I was placed in a real dilemma. On the one hand, I felt that my own reactions to the demands was the right one. On the other hand, I knew that my advisers sincerely held the opinion that unless I acceded to them, their lack of confidence in our Church’s future would cause them, eventually, if not immediately, to secede to one or other of the “canonical Orthodox Churches” represented in this country. My first inclination was to reject the proposals, and, if necessary, to “go it alone”, awaiting further intimation from the Lord as to His will. But, I reflected, this would mean that I would do so with a clergy (such as remained with me) who would have no knowledge or understanding of my mission. By this time, all my clergy were thoroughly orthodox and dependable, and I did not feel that our Church as a whole could survive another split…I saw no way of bringing my advisers round to my way of thinking…accordingly, I decided to let them have their way, agreed to the abolition of the Patriarchate, and other items, and to make an approach to Bishop Jean Kovalevsky, Primate of the Catholic Orthodox Church of France.” The approach to Bishop Kovalevsky during 1969 came to nothing despite his sympathy for the cause of Mar Georgius’s church and full acceptance of the validity of its orders. At his suggestion, the title of the church was changed to “The Orthodox Church of the British Isles”. By now, the Angels of the Catholic Apostolic Church were long since dead, and there were only two CAC priests left in the world. One was Dr. Wilfred Maynard Davson, who was in charge of the church at Maida Hill where the CAC Eucharist was offered for the last time ever in this world on Christmas Day, 1970, before his death on 16 February 1971. The last deacon, Charles William Leacock, an Australian, passed to his eternal reward shortly afterwards on 25 July 1972. Both he and Dr. Davson had reached the age of ninety-five. After this, the only continuation of the CAC proper has been through regular services led by underdeacons, with admittance granted only to the faithful. In April 1970 Mar Georgius announced that he believed that the time before the Great Tribulation and the coming of the Antichrist was growing short, and he therefore felt that it was the Lord’s will that his church should institute the rite of Holy Sealing, a rite of the Catholic Apostolic Church that could only be performed by an Apostle. This rite was instituted so as to set apart the 144,000 (Rev. 7:2-8 and 14:1-5) who are sealed with the Holy Ghost. Mar Georgius therefore proceeded with the institution of this rite within his own church body and also made it available to any other Christian who desired to receive it. The administration of the Orthodox Church of the British Isles devolved on others to an increasing degree as Mar Georgius grew frailer. He passed away on 28 February 1979, by which time his jurisdiction had become virtually unrecognisable from its profile of a dozen years earlier. It was now not merely Eastern Orthodox in its roots, but increasingly so in practice, and it was the aim of those who controlled the church to prepare it for union with one of the “canonical” Orthodox denominations, despite considerable hostility towards it from the mainstream Orthodox churches. For all that Mar Georgius had defined his mission in the explicit terms of a continuation of the work of the Catholic Apostolic Church and specifically the Work of the Seventy, this gradually ceased to be a visible element of his church. In 1994 the synod of his church voted to become part of the Coptic Orthodox Church (as the British Orthodox Church) and another group of clergy rejected this union and on their own authority formed the Celtic Orthodox Church. So much for Mar Georgius’ mission; what of the man himself? His recreations were in liturgical and historical research, and in heraldry. He was a keen supporter of animal welfare. He enjoyed plainsong above other music, but also had a fondness for the lighter Romantics and Gilbert and Sullivan. He enjoyed the romances of the nineteenth-century but also more contemporary crime fiction. He smoked avidly, ideally cigars, but otherwise American cigarettes. He viewed as abominations the modern industrial system, jazz, feminism, democracy, multiculturalism and the United Nations, and regarded television and radio with a very critical eye. He was an ardent monarchist and Jacobite, although not disloyal to our present Queen. Those who knew him reported his lively sense of humour (he was a great teller of anecdotes) and considerable energy. He was founder and head of the Western Orthodox University among other academic bodies, and while these primarily religious correspondence institutions were frequently attacked by the educational establishment, they were nevertheless distinct from the degree-sellers with which they were often mistakenly classified. In chivalry, he was Grand Master of the Jacobite-originated Order of St Thomas Acon, the Order of Saints Gregory and Sarkis, and the Order of the Spiritual Christian Nation inter alia. He was a Chevalier of the Order of the Crown of Stuart, which we have discussed elsewhere, and was created Knight of the Order of the Golden Fleece and Grand Chevalier of the Order of St Louis by the de jure Emperor Otto of Austria. He served as representative for the Empress Zita of Austria in England for many years. The interpersonal and jurisdictional disputes of Mar Georgius’s time have cast a long shadow, and it seems that the majority of contemporary accounts seek to remember him solely through the perspective of his numerous detractors. For others, he is written out of history altogether. This does him a disservice, for his failures were not those of principle or vision but of circumstance; likewise for all that his trenchant ecclesiastical views caused difficulties in his relations with other clergy, there remain those who have cause to remember him with warmth and fondness as one who determinedly stood up for what he believed against the prevailing ethos of his times.